220116 Players from RFL Championship clubs outside York Minster for the launch photographs of the new season in York yesterday(tues). EXPERIENCED play-maker Scott Murrell was Halifax’s representative at yesterday’s RFL’s season launch in York. Last season’s skipper posed for photographs (far right) with representatives of the other Championship clubs outside York Minster. Amateur clubs set the ball rolling this weekend in the first round of the Challenge Cup, sponsored by Coral, with Ovenden and Siddal flying the flag for Calderdale at home to Woolston Rovers and away to Clock Face Miners respectively. The Rugby Football League’s chief executive Ralph Rimmer says he is “positive” about crisis club Keighley Cougars’ chances of starting the season next month. Keighley are due to begin their League One campaign away to Whitehaven on Sunday, February 16. Cougars have been prevented from signing players since being placed in ‘special measures’ last November after wages went unpaid. 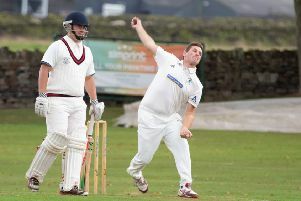 With the club’s future in doubt there are fears they will be unable to fulfil the opening fixture in Cumbria. Rimmer also ruled out any prospect of Toronto Wolfpack being involved in the Challenge Cup this year, despite club officials saying they are keen to take part. The RFL confirmed earlier this week Catalans Dragons will defend their trophy after the French side had threatened to withdraw from the competition. Catalans were angry at being asked to cover a potential shortfall in ticket sales should they reach Wembley again this season, but the RFL say a “compromise” has been reached allowing them to enter the sixth-round draw as planned. However, Rimmer said there is no chance of Toronto being granted a reprieve. Rimmer said details of the compromise allowing Catalans to take part are “commercially sensitive”, but admitted it had been a “tense situation”. Sky Sports will broadcast games from the Championship play-offs at the end of the season, including the Grand Final. Toronto have secured a deal for all of their fixtures to be broadcast live and selected matches from the Championship and League One will be covered on the RFL’s website.